In early November, a retrofitted elliptical machine was installed in the university’s Recreational Sports Facility (RSF). 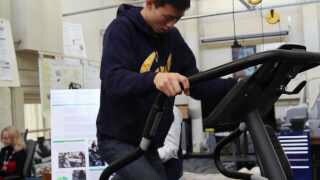 The specially outfitted machine is part of a larger project run by engineering students called the Human-powered Gym. The elliptical machine in the RSF, and another recumbent bike in development, is equipped to convert the energy a user produces while exercising into a cell phone charge. The bike’s charging setup also powers an iPad, which serves as an energy technology education tool that the user can interact with while working out. The project got off the ground about five years ago, when a mechanical engineering undergraduate student, Maha Haji, and mechanical engineering graduate student Kimberly Lau began to think about the energy produced by hundreds of students working out at the RSF. Their initial investigations led them to develop a system to capture exercise-generated energy and plug it back into the electrical grid, which would boost the gym’s efficiency and save on energy bills. But faced with challenges relating to scaling and interfacing with the utility company, the focus of the project shifted. Now, instead of connecting exercise energy to the grid, this latest version of the Human-powered Gym aims to educate users about energy consumption and energy technology by making energy more tangible. Jodi Loo, a fourth-year EECS student, is the current Human-powered Gym lead. Kyle Zampaglione (ME), Matthew Roeschke (environmental engineering science) and Eric Mao (EECS) also have leadership roles in the project. Mechanical engineering professor Alice Agogino is the Human-powered Gym faculty advisor. The team’s work is supported by a grant from the campus-based Green Initiative Fund (TGIF).